Why should you buy alloy wheels for your vehicle? Alloy wheels are made from a special magnesium or aluminum alloy and are meant to be much lighter than standard steel wheels. Incidentally, steel is also considered an alloy since its an alloy of carbon and iron. But the term is reserved for wheels that are made from various nonferrous metal alloys. Also, alloy wheels are meant to be a lot more durable compared to other types of wheels made from pure metals. In the automobile industry, alloy wheels are also called rims. The alloy rims are at times used to reduce the overall weight of the vehicle which helps to improve aesthetics and provides for better heat conduction. According to experts alloy wheels can also have a positive effect on your fuel consumption even if it's by a tiny margin. Alloy wheels were originally called ‘mags’ as they were made from mainly magnesium. They were first introduced in the 1960s. However, because they were extremely expensive early adopters were racing cars owners, namely those used in motorsports. Later on, aluminum alloy wheels replaced magnesium wheels because they were cheaper and slightly lighter and it was then that they started to make their ways to regular car owners. Many people install alloy wheels because they look beautiful. Even low-cost alloy wheels tend to improve the aesthetics of a vehicle as compared to standard steel wheels. However, alloy wheels can yield other improvements such as improving the handling of a car. The improved handling is attributed to reducing the overall unsprung mass which then allows the suspension to follow the terrain, consequently improving grip. That said it's important to note that not all alloys are lighter than their steel counterparts, so it's important only to buy alloys which are lighter because only those will yield better handling, improved fuel consumption, and better heat dissipation. Why are alloy wheels comparatively expensive? The manufacturing process involved in alloy wheels is time-consuming and the materials used are expensive. Most aftermarket alloy wheels are cast and only a few are forged. Companies such as Vellano, Weld, and Donz for instance forge their alloy wheels, but their wheels are many times more expensive than those by other companies. Also, the overall demand for big wheels has spurred new types of alloy designs such as spinners or Tru-Spinners as they are called. So depending on the alloy wheels, you decide to buy it can range from a few hundred pounds to thousands of pounds. The sheer variety of alloy rims can confuse the general buyer who then only relies on aesthetics to make a decision for his or her vehicle. Should you buy alloy rims for your car? Your decision to buy alloy wheels will boil down to two things the first being your budget and the second being what you want to achieve. If you have the money to buy alloy wheels we are firmly suggest that you buy ones manufactured by big name brands because those are of the highest quality. Always go for the best quality you can afford not only because they are extremely durable but also that it will add value to your vehicle. It goes without saying that cheap alloy wheels are unreliable and are known to get damaged after a while, so they need to be replaced. The other thing worth considering is what you want to achieve. If you want better acceleration, aesthetics, and drive comfort, then alloy wheels are the right choice. But if your car is a daily driver and you have none of these preferences then spending money on alloy wheels does not make sense. 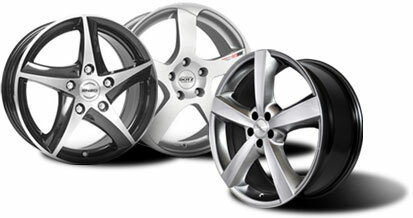 At wheels24.co.uk we have the largest selection of alloy wheels online. We don’t just have alloy wheels by leading brands but also in almost every design and size. Plus, we sell wheels by lesser known brands, but those too are of a high quality. Also, we our alloy wheels are priced very competitively compared to other stores. So, you save time and money every time you buy from us. If you need help or advice buying alloy wheels for your car or are looking for a particular type or brand, then do not hesitate to call or email us today.